This is the best meatloaf recipe I've ever tried. It takes a bit more time than some other beef recipes, but it's worth it! The grated carrot and grated cheese make this a substantial - and delicious! - quick meal. 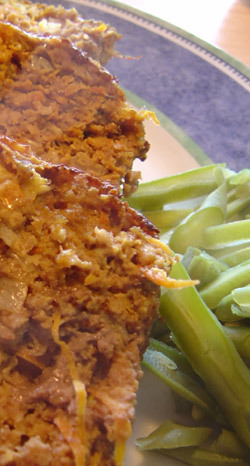 Meatloaf is real comfort food - and this meatloaf is extra hearty and nutritious. Be sure to let it cook long enough - meatloaf always takes longer than I think it will! In a large bowl, mix all ingredients except beef. Add the beef. Mix well. Spoon the mixture into a loaf pan. Bake for at least one and a half hours, until no longer pink inside. Use any non-dairy milk (soy milk, rice milk, etc.) in place of the milk. Use steak sauce or barbecue sauce in place of the Worcestershire - or leave it out altogether. Experiment with different cheeses instead of - or as well as - the Cheddar. How about mozzarella? Try using different ground meats: ground chicken or turkey, or ground pork - or a mixture of half ground beef and half something else. Add your favourite spices. How about thyme or oregano? How about some garlic? I use my clean hands to thoroughly mix all of the ingredients. I prefer using a glass loaf pan when I make meatloaf. It is much easier to clean than a metal pan is! Be sure that the meatloaf is completely cooked. You can use a meat thermometer to test that the meat has reached an internal temperature of at least 160F/71C, or you can cut into the loaf to ensure that there is no pink remaining. Return from best meatloaf recipe to beef recipes.